With Kentucky Basketball season in full swing and Lexington's favorite color splashed all over town, we decided to dedicate this week's outfit to the Wildcats. Of course we had to do it in the most glamorous, fashion filled way. It's no wonder Sally LaPointe's sequined pieces are such a hit on the red carpet - they reflect the light from camera flashes so brilliantly. 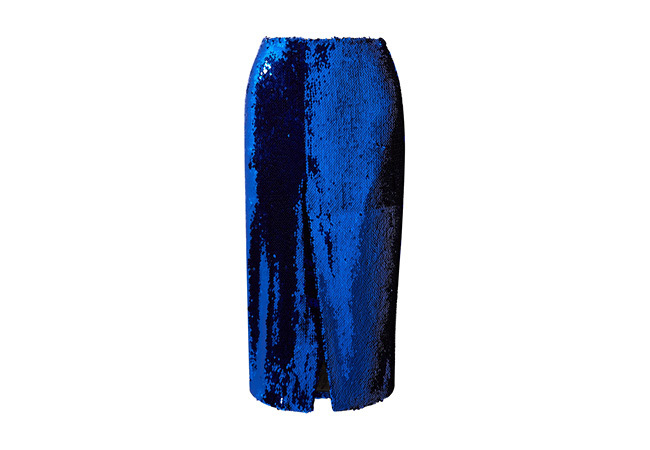 This skirt is covered with royal blue embellishments and lined in smooth stretch silk. Since this piece is super glitzy, we wanted to keep our accompanying top sleek and understated. 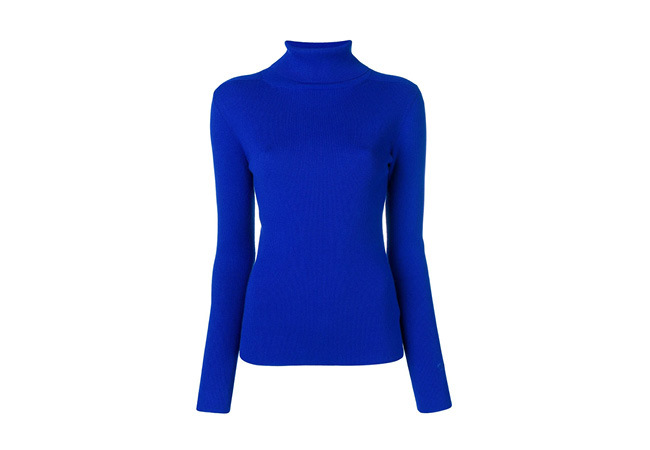 This effortlessly chic turtleneck from Tory Burch features long sleeves, a ribbed knit and a fitted silhouette. Seeing as how wintertime weather has fully kicked in around the Bluegrass, a stylish coat was a must. 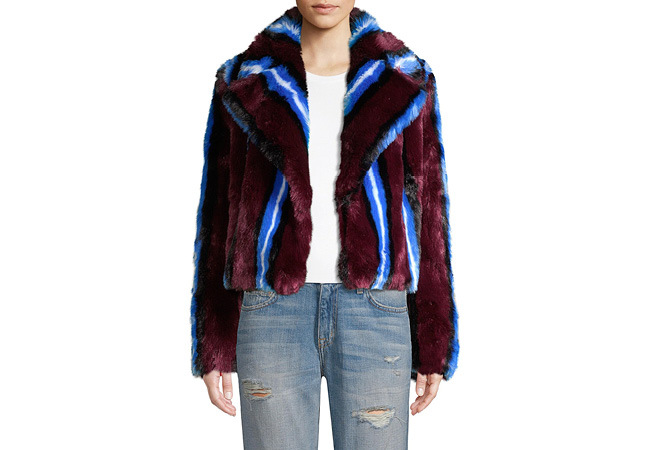 Diane Von Furstenberg's sumptuous faux fur jacket is made for social gatherings. It leads with a bold Cabernet backdrop and follows up with electric blue stripes making for a one shop stopping statement. For footwear, it is all about going light and slinky in an effort to not take away from our beautiful, shimmery skirt and bold jacket. Made in Italy from gold mirrored-leather, Aquazzura's signature 'Linda' stilettos are designed with crisscross suede ties, serving up a sandal with a twist! For our bag, we capture the essence of Italian luxury and glamour with Valentino's Rockstud crossbody. The trendy piece features a foldover top, gold-tone Rockstud embellishments, and an adjustable shoulder strap. Rounding things out in the beauty department, we wanted the makeup look to be all about lashes. 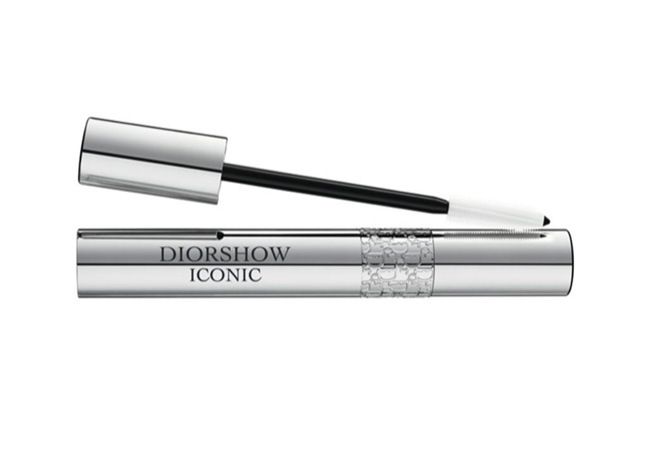 Dior's Diorshow Iconic Mascara is enriched with the Lift Model Extreme complex that boasts properties like those in hairspray to coat and set each lash for extreme waterproof wear. 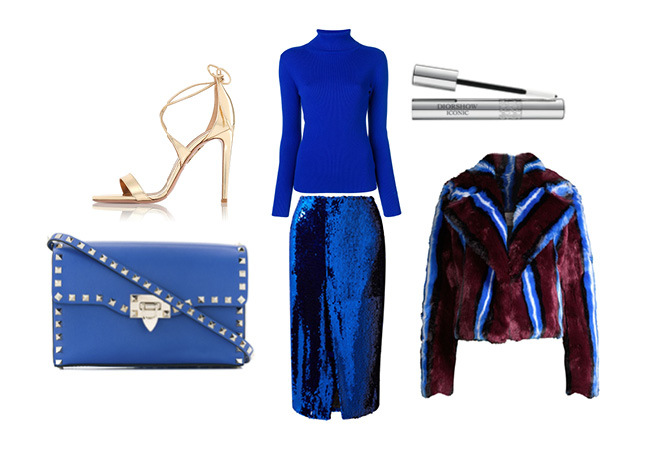 While this might not be a look you could wear court-side, there is no denying that this ensemble is oozing "Big Blue Fabness!"